I am sure you came here today thinking I would have a post about the latest happenings in the NFL since my post last week. While I do have solid thoughts about those situations and some of the commentary I heard over the weekend, I have no desire to write about it. I am all tapped out with the controversies. Right now. Instead, you will get my thoughts about a topic that I have never lended my words to on The Korner: MUSIC. Those that know me well know that I am all about old school music. Music from the 60s, 70s, 80s, 90s and early 2000s with a few newer songs sprinkled in. I grew up on old school music. I have vivid memories of riding in the car with my mother listening to ConFunkShun, The Jackson 5, The Commodores, Sly & The Family Stone, The Temptations, KC & The Sunshine Band, Duran Duran, Michael Jackson, Phil Collins, and the list goes on and on. I have vivid memories of my grandma sitting in her living room with “We Are the World” playing on the record player as she tapped her foot to the beat of the music. I have vivid memories of gathering with the family around the television to watch MJ debut his newest video on primetime television. I am talking about 8:30pm on a Thursday. That kind of primetime. I love music! On my iPod you can find Chris Tomlin, Bon Jovi, The Notorious B.I.G., Backstreet Boys, Usher, TLC, Metallica, Kirk Franklin, Justin Timberlake, Jodeci, Tye Tribbett, MC Hammer, The Mississippi Mass Choir, Gladys Knight & the Pips, and the list goes on and on and on. However, what you will not find is music from artists who came out let’s say ummmm 2007 or later except for Rapsody, Bruno Mars & Justin Bieber. Hey! I love “Baby”, “One Time” and “As Long As You Love Me” plus The Biebs is talented. And if you are not up on Rapsody then you need to make that a priority to do so. I do not know what happened but today’s selection of newer artists is less than stellar. Now there are some newer artists, in addition to the Biebs, that are very talented: Adele, Imagine Dragons, Kings of Leon, Lupe, to name a few. However, the quality of music as a whole, in my opinion, lands somewhere between wonk, eh and booooo. 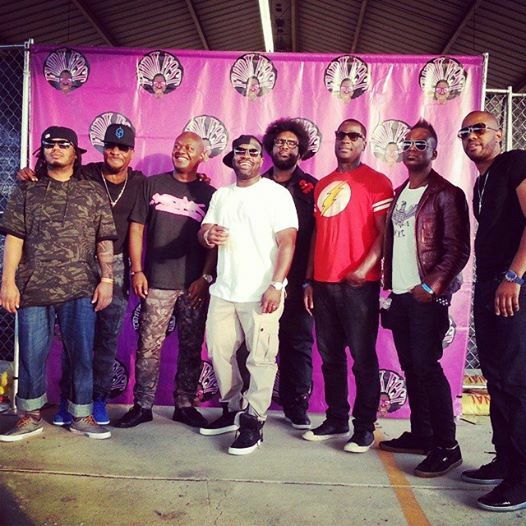 Due to my love of old school, you can imagine how excited I was to be attending Funk Fest in Charlotte this weekend. The lineup was one of the craziest I had ever seen put together: Salt n Pepa, Fantasia, Doug E. Fresh, B.O.B., OutKast, Olivia, 95 South/69 Boyz, 112, War, The Roots, Ice Cube & LL Cool J. Yes people. This all took place in ONE location. On ONE stage. You cannot get much better than this. Friday evening started with a road trip to Charlotte with my girls that soon turned into a night that we would never forget. The one thing about shows like this is that theyare long, typically outside and will go on rain or shine. Oh and September in North Carolina, you know that humidity was on scorch. So we arrived at the venue, having missed Salt n Pepa(bummer but I was glad I got to see them a few years ago) to find thousands of people mingling around the fairgrounds where Funk Fest was being held. We quickly all settled into our seats to get ready for the night to remember. I was excited to see Fantasia whom I had never seen perform. I follow her on Instagram and I have been thrilled to see the progress she has seemingly been making in her personal life. She looks amazing! Fantasia is high energy and despite the heat and humidity she gave us her all as she took us through her catalog of hits. She danced, jigged and took off her shoes, ala Ms. Patti. I truly enjoyed her showmanship and definitely want to see her again. Of course, everyone was hyped after witnessing greatness but it would not last long. We were soon told that we had to seek shelter due to an approaching thunderstorm. Everyone quickly hurried into the exhibit halls to wait out the storm that took almost an hour and a half to pass. Soon we were able to return and anxiously await the arrival of Big Boi and the man known as 3Stacks, to grace the stage. Are you wondering why I did not mention B.O.B.? Well he is one of those new artists whom I do not listen to. I tried to give him a chance but his music sounded like everything else I have heard from the majority of these new artists. A bunch of fluff. After waiting in the heat and the rain, it was finally time to see the group that put Atlanta on the map: OutKast. I had the pleasure of seeing Outkast in 1998, shortly after their release of their third album, “Aquemini.” However, to get a chance to see them again, after 20 years in the biz and after all the ups and downs the group had been through was enough to make me do a cartwheel. From the time they stepped on the stage and their PHENOMENAL band lead us into the outerspace intro beat to “Bombs Over Baghdad,”, the energy level was through the sky. They set the tone for their performance from the beginning as they took us on a trip down memory lane to the house of nostalgia with an array of hits such as “Ms. Jackson,” “Skew It On The Bar-B,” “Southernplayalistic,” “Hey Ya,” “Roses,” “The Way You Move,” and one of my all time faves, “Aquemini.” And when they paid respects to their dear friend, the late Pimp C, by performing the classic banger, “International Players Anthem” they sent the crowd into an unexpected frenzy. The layout of hits was delivered just right as both Big Boi and Andre each did short solo sets that highlighted their creative geniuses that were evidenced on the Grammy award-winning “Speakerboxxx/The Love Below.” There had been talk, even recently from Andre himself, about how he gets nothing out of performing. Even if that was the case, on this particular night it was anything but noticeable as he smiled and laughed continuously throughout their set. The interactions between him and Big Boi was like watching old friends/family pick up right where they left off. As we all stood in the rain, singing and rapping loudly, I smiled. I was reminded that this is what life was all about. Priceless moments. The next day proved to be just as exciting as the day before. 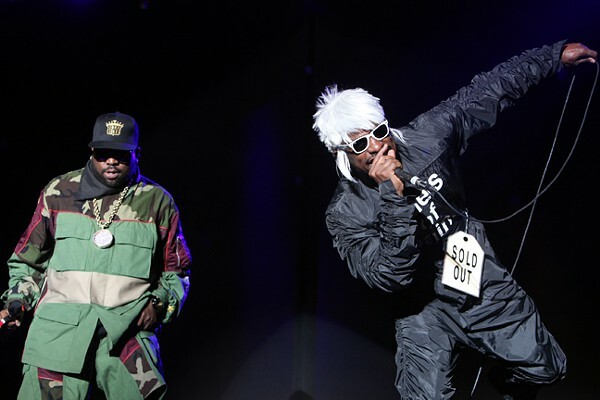 However, with all the hype that has surrounded OutKast’s return to the stage, their performance was hard to top. I enjoyed seeing War. They are one of those groups that I grew up listening to with my mom. At almost 70 years old, those men still put on a show that will put a lot of young acts to shame. Following them was a group that was sure to receive some respect from them: The Roots. As a huge fan of Jimmy Fallon, I have fallen more and more in love with the talent of The Roots. I have loosely followed them for years but seeing them perform night after night first on Late Night and now on The Tonight Show, my level of respect for their craft is heightened. They are crazy talented! I could not get enough of their musical intricacies. They are definitely in the upper echelon when it comes to bands. 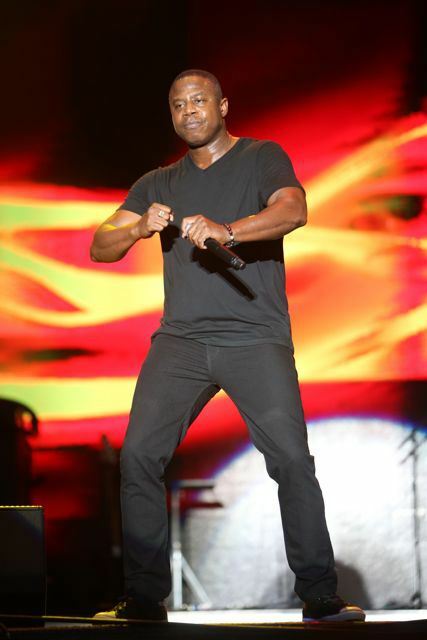 Last year, I saw both Ice Cube and LL Cool J perform during the Kings of the Mic tour so I knew to expect performances that were energized and full of hits. Neither disappointed. Well, LL did but it was not his fault. 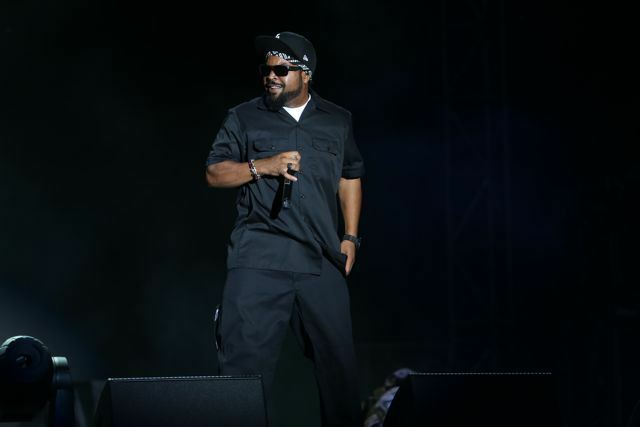 Wait, Cube did too because he did not do any NWA stuff like he did last year. I was ready to rap “Straight Out of Compton” like I was straight out of Compton. Unfortunately, right before LL’s set started it started to rain again. Just like the night before, most people did not care. A little rain never hurt anyone. Plus this is LL we are talking about. He has hits for days. 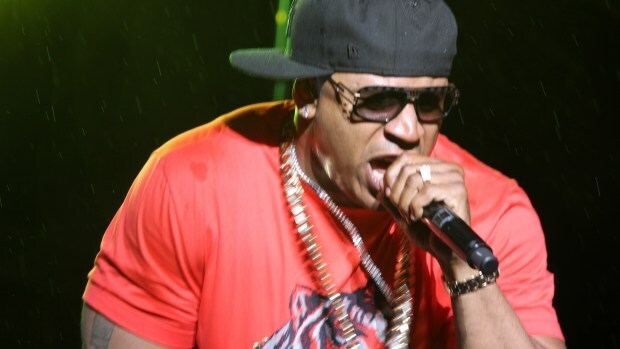 Well as much as LL wanted to perform his whole set, the powers that be made him cut it short(he only performed 30 minutes of his hour and a half set) because of how much rain was on the stage and they were concerned for his safety. I get it. I really do. However, between Friday and Saturday night the powers that be should have been able to rectify that situation in the event that it rained, again. We stood out in a baby monsoon at times to watch OutKast perform and you mean to tell me that you could not figure out a way to let LL continue performing even though it was no longer raining? Shaking my head. As you can see, despite the heat, humidity, rain, lightning and thunder, I had an absolute ball! One of the best concerts I have been to. A collection of artists that have stood the test of time and can still deliver performances that are worthy of witnessing again. I thoroughly enjoyed every performance. However, I have to say seeing OutKast after so many years of wishing they would get back together was everything I had hoped it would be. Although their set was an hour and a half, it was too short. I wanted more! It has been a loooooong eight years between their last album and this performance. Add this OutKast high to my New Edition high that I am still on and you have a Kassie that will be floating in the clouds for a loooong time. I feel sorry for the kids that are growing up these days thinking what these new artists are putting out is music. Many will scream that I am getting old because I say that. My rebuttal is that it has nothing to do with my age and everything to do with the quality or lack thereof of talent, diversity and creativity. There is not one artist, other than maybe Adele, that this generation can honestly say will be able to sell out shows 20 years from now. Not one! Sad state of affairs. Well, at least they have the 60s, 70s, 80s, 90s and early 2000s if they want to learn to appreciate REAL music. Enjoy youngins!